Ed. note: A special Monday edition of “Silver Screen Reflections” (since tomorrow is Halloween)! Early Halloween greetings to all fellow SvenPals near and far from the writer of “Silver Screen Reflections!” -C.H. Fellow Svengoolie SvenPals from coast-to-coast will be jumping for joy this Sat. as he will showcase a 1957 Universal Studios insect creature feature. Original 1957 Universal Studios theatrical trailer for “The Deadly Mantis” (from “100 Years of Monster Movies”). The legendary Berwyn/Chicago-based horror film host will be showcasing “The Deadly Mantis” (1957), this Sat., Nov. 4 at 8 p.m. Eastern/7 p.m. Central on Me-TV! The film was directed by Nathan H. Juran, who also worked on “20 Million Miles to Earth” (1957), “Attack of the 50 Foot Woman” (1958, under the pseudonym of Nathan Hertz), “The 7th Voyage of Sinbad” (1959, with Ray Harryhausen’s “Dynamation” stop-motion sequences) and “The Boy Who Cried Werewolf” (1973). This will mark Sven’s sixth broadcast of the 1957 Universal insect thriller. He had previously shown Juran’s feature on Me-TV back in Jan. 2012, Oct. 2012, March 2013, May 2014, and Nov. 2015.
Who was in “The Deadly Mantis” (1957)? 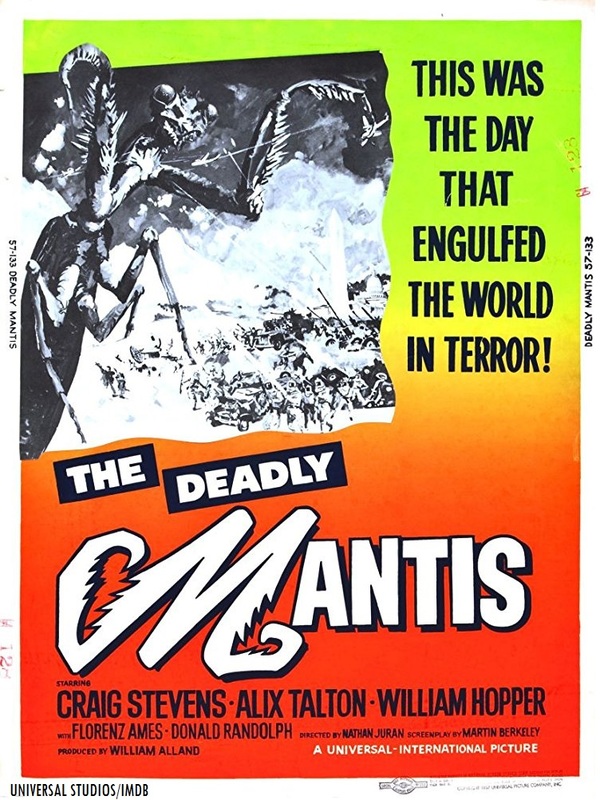 The players who appeared in “The Deadly Mantis” were Craig Stevens (as Col. Joe Parkman), William Hopper (as Dr. Nedrick Jackson), Alix Talton (as Marge Blaine), Donald Randolph (as Maj. Gen. Mark Ford), Pat Conway (as Sgt. Pete Allen), Florenz Ames (as Professor Anton Gunther), Paul Smith (as a Corporal) and Phil Harvey (as Lou).